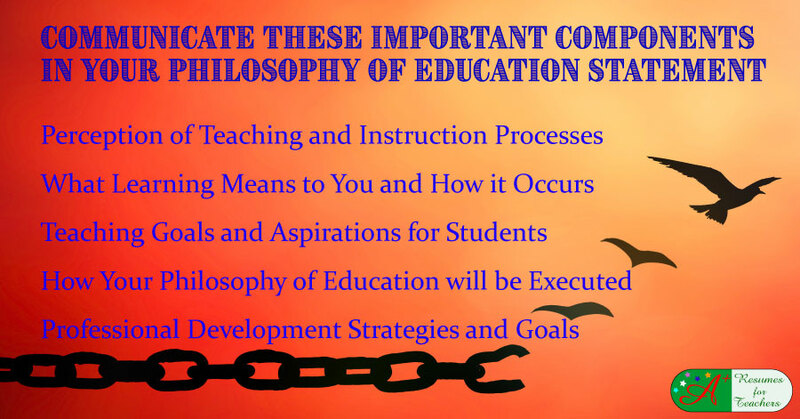 A philosophy of education statement is an integral component of your teaching portfolio. This statement helps to demonstrate how you have been purposeful about your teaching. It also enables you to communicate your goals as a teacher and illustrate how your teaching concepts can be transformed into real classroom activities. Most teaching job applicants are now being asked to articulate their education philosophy into a Philosophy of Education Statement. Your perception of teaching: Here you describe what teaching means to you, your teaching processes, and how you can facilitate those processes as an educator. Issues such as motivating students, facilitating the learning process, how to challenge students academically, and how to support their learning abilities should be addressed. Your perception of learning: Here you try and describe what learning means to you and what exactly happens in a learning situation. You can either use metaphors to draw comparisons with known philosophies, or you can directly relate what you think happens during a learning session based on your personal experiences as an educator. Your teaching goals: In this section you describe your goals for your students and also list the various talents or skills that you expect your students to acquire through your teaching. In addition to the goals that you have set for your students, you should also provide the rationale behind these goals and how you will keep changing the goals to meet the growing learning needs of your students. Executing your philosophy of education statement: The most important component of your education philosophy statement is your elaboration of the different activities that you will implement to enable your students to achieve their goals. You have to illustrate how your perceptions of teaching and learning will be translated into real time class assignments. Your growth as a teacher: In order to continue growing professionally, teachers need to set goals for themselves and also outline their ways to achieve these goals. The personal goals that you have set for yourself as an educator should thus be mentioned in your philosophy of education statement. Ensure that it is not more than 2 pages long, unless a detailed description has been asked for. Write in the present tense and in an active voice as it is easiest to read and relate to. Do not use too much technical jargon but try and use language that will be understood by broader audiences. Include specific examples of your personal philosophy of teaching so that the reader can actually 'see' how you interact with your students even though they have not visited a real class that you teach. Give your philosophy of education statement a lot of thought and ensure that you write about your personal beliefs and real experiences. If you simply churn out a standardized education philosophy statement, that will come across to the reader and will not be as impressive. Consider getting your philosophy of education statement written by an expert with your personal inputs so that you can ensure that you have an A+ teaching philosophy statement. If you need help preparing your Philosophy of Education, don't hesitate to email Candace at A+ Resumes for Teachers by clicking here. Does Your Philosophy of Education Statement Reflect Who You Are?